I know someone who could come in and train us in Arabic singing, offers one young woman. I want to belly dance, another blurts out. The group has just finished acting out Prince with Three Fates, a student-created story about the struggle between an Egyptian child and his adoptive parents. Besides improvising movements to accompany the drama, the students are helping to determine which actors and stories will be included in their companys upcoming season. Addison Repertory Theatre  A.R.T.  is an alternative program designed to prepare Middlebury area teen-agers for the working world of theater. Nine years ago, when it was established, making the leap from theater class to an adult stage meant a schlep  if not all the way to Broadway, then at least up to Burlington. But in the last couple years, Middlebury has witnessed the rise of an increasingly vital theater scene of its own. In addition to A.R.T. and the long-standing theater program up the hill at Middlebury College, the town supports not one but two independent acting companies. In this burg of 8000, the allure of the limelight seems to be infectious. Created in 1994 by a group of area artists, writers and educators hoping to provide a nurturing environment for emerging talent, the A.R.T. program found a home in the Hannaford Career Center, a two-year, vocational facility located next to Middlebury Union High School. Now in its ninth year and run entirely by its 64 students and two instructors, A.R.T. produces a popular four-show season of student work that, along with various grants and a parent foundation, helps the comprehensive program pay for itself. Students arent the only ones using the high-ceilinged 90-seat black-box performance space, a former woodworking shop that was transformed by Small and his tech students in 1997. 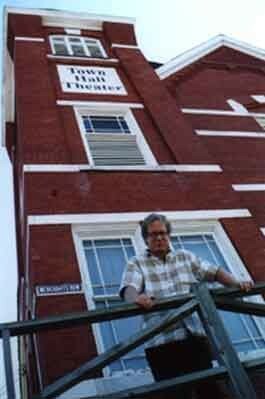 The oldest and most resourceful band of actors in Addison County  the Middlebury Community Players  inaugurated the space that year and has since put on several of its smaller productions there. Prior to that, the group did its itinerant theater thing in barns, old-folks homes, a courthouse building and the Corn-wall grange. Formed in 1959, the Middlebury Community Players grew out of a reading group of townspeople and members of the Middlebury College community who wanted to act out the material. The still very active group of roughly 400 members includes occasional students and professors from Middlebury College. A high school student sits on its board of directors. Typically, the Players put on a musical in the spring and a comedy or drama in the fall last year they did Steel Magnolias and Chicago. Occasionally, theyll squeeze in a third production of one-act plays. We do family-oriented things, but we also do a little more experimental and some edgy things, explains Players President Elinor Friml. The troupe is still pinning down dates for its fall production, a premier of a new play written by Pulitzer Prize-winning Rutland Herald editor David Moats, a Middlebury resident who is a past president of the group. The comedy, entitled A Trip to the Moon, will most likely run in mid-November at the A.R.T. studio theater. Enter Doug Anderson  the lanky, bespectacled Player from East Middlebury who is overseeing the transformation of the former Knights of Columbus hall into a full-fledged cultural center. Its still unheated and in a state of disrepair, but it recently hosted a busy summer season there, drawing appreciative audiences for Chicago and an evening of Broadway show tunes and musical comedy by the Burling-ton-based quartet Encore. The Middlebury Actors Workshop also had a good run there. Though she had some reservations in the beginning  namely the battalion of bats in the belfry and structural concerns  Actors Workshop founder Melissa Lourie said the group is looking forward to more at the renovated Town Hall Theater. Its a wonderful, wonderful space, says Lourie, who also started the still-successful Hudson Valley Shakespeare Festival in New York. The group, which Lourie convened two years ago, started with six core members: Jeanne Rogow, a screenwriter and actress who is currently editing a 30-minute film called Town Meeting; Harry McEnerny, a theater prof at Castleton Stage College; Stephen ODwyer, a professional actor and physical therapist who lives in Shelburne; Steve Small, the director of the A.R.T. program; and his wife, Shannon Bohler-Small, who teaches dance at Middle-bury Union High School. Yeaton also teaches at Middlebury College, which hosts one of the best theater programs among small, liberal arts colleges in the country, according to its chair, Douglas Sprigg. Sprigg has seen a lot of changes since arriving in 1976, when a separate theater department was established. Weve increasingly had stronger and stronger productions, he says, noting generous support from the colleges administration has helped the program grow at a rapid pace. Today, Middlebury boasts a sizable stable of accomplished faculty and staff, guest residencies and affiliations with world-renowned theater companies, and a plethora of campus venues ranging from the classic, 350-seat proscenium Wright Memorial Theatre; the state-of-the-art, 175-seat, black-box Seeler Studio Theatre; and the tiny 35-seat Hepburn Zoo Theatre that houses the 12 to 16 student productions during the school year. Recent graduates have recently been written up in The New York Times for new theater companies they started in New York City and Washington, D.C., for becoming the youngest playwright ever produced at the prestigious Williamstown Festival, and for writing and appearing in various Hollywood productions. This year, the college is pulling out all the stops to celebrate the tenth anniversary of its Center for the Arts, a performing and visual arts mecca of its own that has attracted hordes of culture vultures, both on-campus and off. In addition to the four faculty-directed productions  which Sprigg describes as somewhat eccentric  the college is bringing in legendary playwright Edward Albee as well as acclaimed actor and singer Rinde Eckert and innovative director Ann Bogart.